Welcome to the home page for the open source WordNet SQL Server project (GPL). This project is maintained and managed by Troy Simpson. The database itself is a direct port of the WordNet for MySQL project to SQL Server 2005. A custom browser has been written from scratch. This is a tool for serious researchers and NLP developers. The database can be utilised in any language or application that supports SQL Server Express 2005. The database can be scaled up to SQL Server 2005. 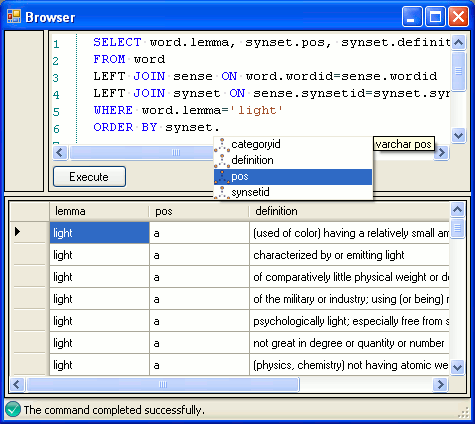 Included in the database are WordNet, XWordNet and VerbNet.